Echo Picotee Lisianthus, originally uploaded by DianthusMoon. I got to spend some outside today potting and repotting flowers and not roasting doing so. I could stand to do weeding. Bri stopped and got me a spool for the Weed Whacker, but not in the mood to do that. I did make some homemade potato salad to eat with our fat-free hotdogs. 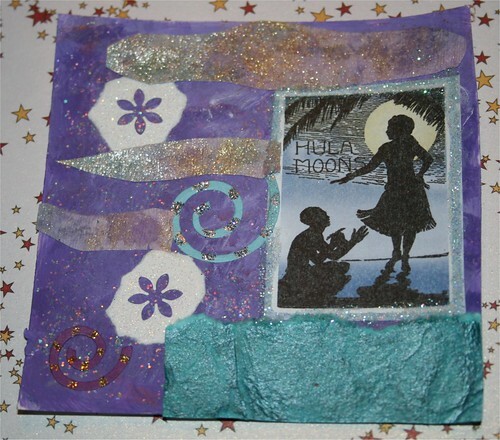 I also sat and got inspired to do a few more collage cards. I must have purple on the mind! 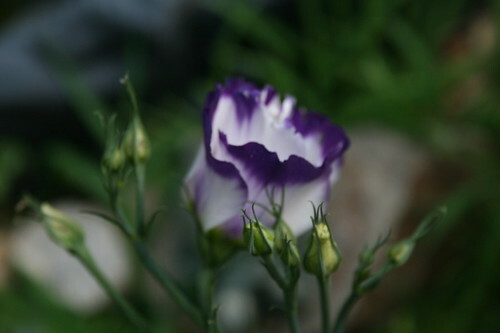 The Lisianthus is called Echo Pictotee. Haven’t had too many of these in the garden, but I am liking it! Got two (buy one, get one free) from the Amish lady. It’s like a rose and tulip in one! Mom may come out tomorrow to go to Longwood Gardens. : ) Hope so! 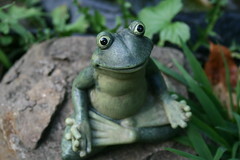 Love the frog for the pond garden! Tomorrow I plan to go to Art on the Bay..an arts/crafts show. 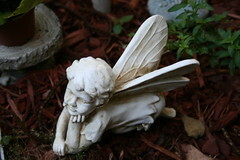 I always look for some critter for the garden. Echo Pictotee is very pretty!